Sometimes referred to as the father of Scottish vernacular poetry, John Barbour was born round about 1320, during the reign of King Robert the Bruce. He was a member of the royal household of King Robert's successors, King David II and Robert II, and was involved in two political visits to France. He became Archdeacon of Aberdeen in 1357. But it is epic poem "The Brus" for which Barbour is best remembered. This patriotic epic about the life of the king who, against all the odds, managed to drive out the occupying Engliah army, consists of 14,000 octosyllabic lines and was composed in 1375. It recounts in detail the Wars of Independence to the death of Bruce and the Black Douglas. He used information provided by contemporaries of Bruce and to that extent it is of value to historians as well as a dramatic work. But Barbour ignores any negative aspects of his hero, including the period when Bruce vacillated between serving the English King Edward I or Scotland. 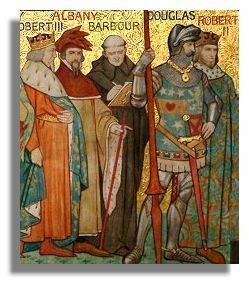 Barbour's tale of valour and chivalry and great deeds was written at a time when Scotland was being governed by weak rulers such as King Robert II and Robert III. The latter described himself as the "worst of kings and the most miserable of men" a description with which few would argue. The illustration here (from a frieze in the atrium of the National Portrait Gallery in Edinburgh) shows Barbour with some of hos contemporaries. The first Duke of Albany was the third son of King Robert II.